Nikos Papastergiadis is the Director of the Research Unit in Public Cultures, based at The University of Melbourne. He is a Professor in the School of Culture and Communication at The University of Melbourne and founder - with Scott McQuire - of the Spatial Aesthetics research cluster. 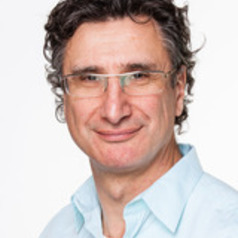 He is Project Leader of the Australian Research Council Linkage Project, 'Large Screens and the Transnational Public Sphere', and Chief Investigator on the ARC Discovery Project 'Public Screens and the Transformation of Public Space'. He was educated at The University of Melbourne and the University of Cambridge. Prior to joining the School of Culture and Communication, he was Deputy Director of the Australia Centre at the University of Melbourne, Head of the Centre for Ideas at the Victorian College of Arts, and lecturer in Sociology and recipient of the Simon Fellowship at the University of Manchester. Throughout his career, Nikos has provided strategic consultancies for government agencies on issues relating to cultural identity and has worked in collaborative projects with artists and theorists of international repute such as John Berger, Jimmie Durham and Sonya Boyce. His long involvement with the ground breaking international journal Third Text, as both co-editor and author, was a formative experience in the development of an interdisciplinary and cross cultural research model, which continues to inform his research practice. His publications include Modernity as Exile (1993), Dialogues in the Diaspora (1998), The Turbulence of Migration (2000), Metaphor and Tension (2004) Spatial Aesthetics: Art Place and the Everyday (2006), Cosmopolitanism and Culture (2012). He is also the author of numerous essays, which have been translated into over a dozen languages and appeared in major catalogues such as the Biennales of Sydney, Liverpool, Istanbul, Gwangju, Taipei, Lyon, Thessaloniki and Documenta 13.